9 vanilla cheesecake bites, 9 lemon cheesecake bites, 18 chocolate cheesecake bites. 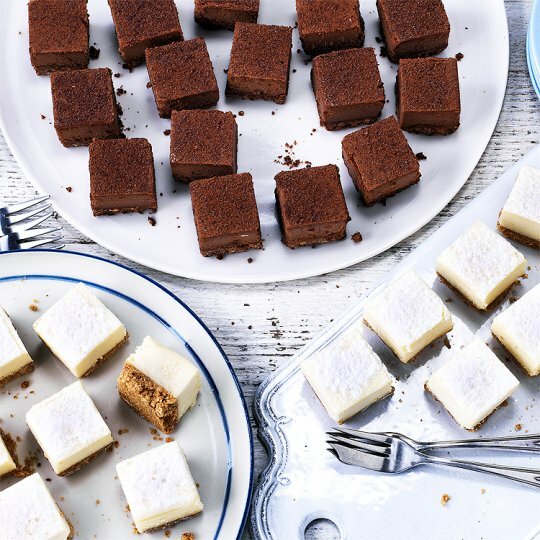 A selection of 4x9 individual creamy cheesecake bites in 3 different flavours; chocolate, vanilla and lemon. This product is part of the Tesco Festive Food to Order range. So that we can get this product to you in time for your delivery or collection slot, please ensure that you have checked out by 23:45 on the 14th December. Beyond this date, the Festive Food to Order products cannot be amended, but non Festive Food to order products can still be amended. Keep refrigerated., This product may have been previously frozen and has been restored to chill temperature under carefully controlled conditions. Not suitable for home freezing. Wheat Flour (Wheat Flour, Calcium Carbonate, Iron, Niacin, Thiamin), Full Fat Soft Cheese (Milk) (16%), Sugar, Vegetable Margarine, Belgian Dark Chocolate (10%), Palm Oil, Soured Cream (Milk), Pasteurised Egg, Single Cream (Milk), Invert Sugar Syrup, Fat Reduced Cocoa Powder, Rapeseed Oil, Cornflour, Dextrose, Emulsifiers (Polyglycerol Esters of Fatty Acids, Mono- and Di-Glycerides of Fatty Acids), Raising Agent (Sodium Bicarbonate), Salt, Stabilisers (Xanthan Gum, Carob Gum). Belgian Dark Chocolate contains: Cocoa Mass, Sugar, Cocoa Butter, Emulsifier (Soya Lecithins), Flavouring. This product may have been previously frozen and has been restored to chill temperature under carefully controlled conditions. Defrosted: It is not suitable for home freezing. Wheat Flour (Wheat Flour, Calcium Carbonate, Iron, Niacin, Thiamin), Full Fat Soft Cheese (Milk) (17%), Sugar, Vegetable Margarine, Single Cream (Milk), Pasteurised Egg, Palm Oil, Demerara Sugar, Invert Sugar Syrup, Water, Cornflour, Rapeseed Oil, Dextrose, Flavouring, Emulsifiers (Mono- and Di-Glycerides of Fatty Acids, Polyglycerol Esters of Fatty Acids), Lemon Juice, Raising Agent (Sodium Bicarbonate), Salt, Stabilisers (Xanthan Gum, Carob Gum). Full Fat Soft Cheese (Milk) (24%), Wheat Flour (Wheat Flour, Calcium Carbonate, Iron, Niacin, Thiamin), Sugar, Vegetable Margarine, Pasteurised Egg, Single Cream (Milk), Palm Oil, Lemon Juice (2.5%), Demerara Sugar, Invert Sugar Syrup, Water, Lemon Purée, Rapeseed Oil, Dextrose, Cornflour, Emulsifiers (Polyglycerol Esters of Fatty Acids, Mono- and Di-Glycerides of Fatty Acids), Raising Agents (Sodium Bicarbonate), Salt, Stabilisers (Carob Gum, Xanthan Gum).